If you have a penchant for perusing historical broadcasts, then you might just like PopUp Archive. Launched last week in cahoots with the Public Radio Exchange, PopUp Archive serves up thousands of hours of lost radio broadcasts, including interviews with some well-known names – check out Buster Keaton explaining silent film captioning to Studs Terkel. PopUp Archive’s technology ‘listens’ to the audio, tags and timestamps it, thus making it searchable by keywords. So if an old interview is uploaded without any accompanying notes, this makes it possible for you to carry out broad searches on its database for mentions of names and events within the broadcast. 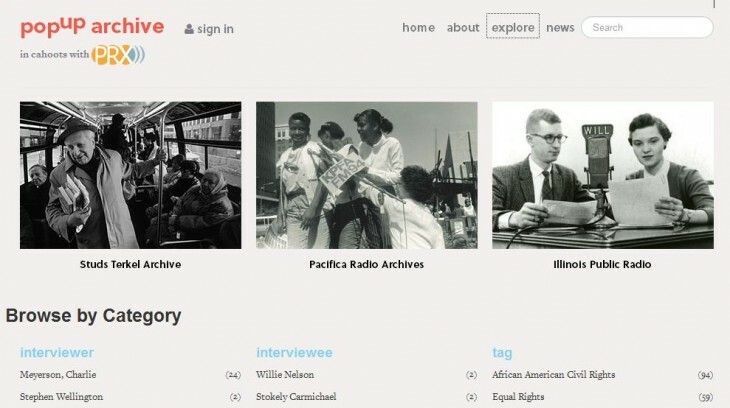 Initial Pop Up Archive partners include the Pacifica Radio Archives, Illinois Public Media, the Center for Investigative Reporting, and the Studs Terkel Complete Radio Archive, which is being developed by the WFMT Radio Network and the Chicago History Museum. It has been developed with support from the Knight Foundation, and the National Endowment for the Humanities.